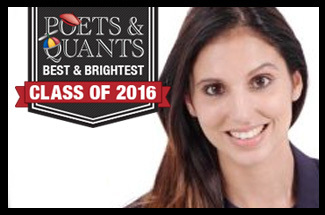 IE Business School - International MBA | Michelle Beretti speaks to Poets & Quants! Michelle Beretti speaks to Poets & Quants! Where did you intern during the summer of 2015? I took advantage of the time between Term 1 and Term 2 (summer break) to travel across Europe, exposing myself to new cultures , meeting new people and ultimately expanding my network. Where will you be working after graduation? I am currently looking for opportunities within the technology sector in Europe, where I can leverage my consulting experience and MBA skills in a dynamic, fast-paced environment. President of the Luxury Goods & Services Club – our Club has been selected by MBA Arena to partner with LinkedIn on a knowledge sharing initiative along with eight other top business schools. Board member of the Diversity Club, which was launched six months ago in conjunction with IE Business School’s Centre for Diversity in Global Management. Involved with on-boarding the new MBA intake through holding presentations and sharing key learnings. Being chosen as the Commencement Speaker for the new January 2016, IE Business School MBA intake (350+ audience). I was honored to be selected since it is a great opportunity to share my personal story with those who have not even begun to embark on their business school journey. The introspection and reflection to tackle a task such as this is immense but the positive affirmation received afterward is unbeatable. Being selected for the Brightest Young Minds (BYM) Summit in 2014. BYM is a 15 year old non-profit company that exists to create a positive social impact through identifying, connecting and mobilizing individuals and projects. Each year, 1,500 individuals across Africa apply and 100 are selected to participate in the Summit in Johannesburg, South Africa, where the focus is on making life-changing ideas flourish. I believe that this is an honor as BYM identify individuals who have demonstrated their commitment to positive social change through their actions. Coming together with other young leaders across Africa to work on social and environmental challenges throughout the week was a huge inspiration and I felt honored to be involved. Reputation: IE has been consistently ranked in the top cluster for their full-time MBA program (Financial Times). Diversity: IE Business School drives and embraces unconventional thinking and has created an ecosystem where students can benefit from the knowledge and the experience of their peers. My intake is comprised of individuals from over 65 different countries interacting, engaging and solving problems together on a daily basis. Since there are two intakes per annum, students are afforded the opportunity to network with both the previously enrolled and post enrolled intakes to increase their access to contacts. Location: Being located in Spain’s capital City, is definitely one of IE Business School’s competitive advantages since it brings with it the ability to network both inside and outside of the school with ease. Focus on entrepreneurship: IE Business School was founded by entrepreneurs and the entrepreneurial spirit forms an integral part of the IE environment. Companies are looking for entrepreneurially-minded individuals who demonstrate traits such as persistence, determination, independence and ownership. What did you enjoy most about business school? The community of people (both the students and administration), the case method and emphasis on team work. I had fantastic classmates and our section is very close and connected. Everyone had their own reasons for enrolling in the program, but each of us was focused on improving or advancing some aspect of our lives. I’ve enjoyed interacting with smart and respectful people on a daily basis and making lifelong friends across the world. Mark Zuckerberg once said – “A lot of the time the experts, the people who are supposed to be able to tell you what to do, will tell you that you cannot do something even when you know you can. And a lot of the time it’s your friends who tell you you can do it.” I urge those who are enrolling in an MBA program to embrace your peers, cherish the connections and make time to help each other. The biggest lesson I gained was to be comfortable with uncertainty. I now feel comfortable and confident making decisions with limited information. Outsiders believe that the hard skills are the most important learnings of business school, but I don’t believe that they are; the most important lessons in my opinion are the ability to adapt, interpret and to remain humble, while achieving great milestones. What surprised me the most was how much I learned from my peers, both inside and outside of the classroom. Diversity is a major plus at IE Business School – the different experiences and perspectives are what makes the program that much more enriching. The cultural diversity and openness to change with 65 different nationalities learning together in one place is very rewarding. It is a place where your cultural, religious or ideological background adds tremendous value to an already diverse student body. Being able to say no. If you’re the type of person who wants to be involved in everything, know that it will be impossible. It was incredibly difficult to narrow down and focus on what I really wanted to be involved in and what I didn’t. You will not have the time to do everything so pick wisely. Through the process I learned that it takes courage to say no to certain tasks, but it is also an instrument of integrity and a shield against exploitation. Which executive or entrepreneur do you most admire? Yusuf Randera-Rees, CEO and Co-Founder at Awethu Project in South Africa. Yusuf gave up a career in investment banking to build an incubator to help previously disadvantaged young South Africans build sustainable businesses for the future. What started as a ZAR60k project has grown into a company with millions of Rands to invest in their vision. Hundreds of entrepreneurs have been incubated over the past six years and thousands of lives have been improved as a result. I admire Yusuf for his down to earth nature, inspiring attitude, sense of humor and his ability to choose the harder, but ultimately more rewarding, path in life. I’ve completed a consulting project at Awethu and I’ve seen Yusuf speak in public on a number of occasions. His ability to capture the attention of his audience is quite something. In the long term, I’d like to set up my own business. I am passionate about internet/online businesses and how ‘unbanked’ individuals can access resources, especially in places like Africa. I’d like to focus on access to education through electronic means. Driven by ruthless curiosity and the determination to build a better world, I believe compassion uncoupled of practical skills is futile and that information is power. Imagining possibilities beyond what is already obvious inspires me to live with a contagious enthusiasm. I would thank my parents and mentors around me – who raised me to be very resilient and to be curious about the world around me. I’ve been encouraged to cultivate and create opportunities and have always been supported when embracing them. If you don’t live your dream, someone else will. Bungee jumping over the Zambezi River off the bridge between Zambia and Zimbabwe (technically in no-mans-land), 111 metres high, spanning the magnificent Batoka Gorge. Fortunately I tempted fate 4 months before the rope snapped and an Australian woman fell into the river – luckily surviving. What made Michelle such an invaluable addition to the class of 2016?